When I started to make cheese I jumped head first into semi-firm cheese. When I got my first kit from Danlac for Father’s day several years ago I had no clue what I was doing, I tried making “Ricotta” but it was a hard puck and inedible. The almost two years of research, reading recipes/directions on cheese making, lurking on cheese making websites sites help a bit but I should have started with fresh cheese and not something that needed to be aged. Part of the purpose of Cheesepalooza for me is to “re-set” my cheese making, so I have hit the reset button (I have not erased my “saved games”) and now the journey starts again. 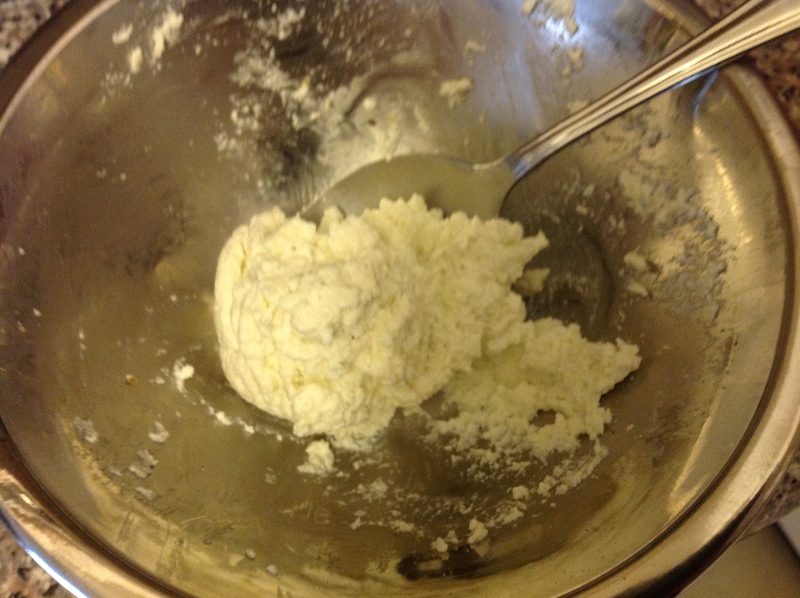 This time it is a return to Whole Milk Ricotta and I had hoped that it was not a repeat of the first attempt. I was nervous about making this, my cocky cheese swagger was gone, and I was hoping to make it right. First off I want to do a full disclosure on this, I don’t really like Ricotta and if I make it I tend to give it away rather than eat it myself. I came up with some flavouring for the Ricotta to help solve my issue with it. Also I could not find Citric Acid, I normally buy it a Bulk Barn, but they were out and they would not have it in prior to the Cheesepalooza meeting. In the Mary’s book she says you can use lemon juice as a substitute so that is what I did. The directions are basically the same as in the book, but you add the lemon juice when you are at temperature not before. The usual suspects are in the line up. So now with my ingredients in hand it was time to start the process. 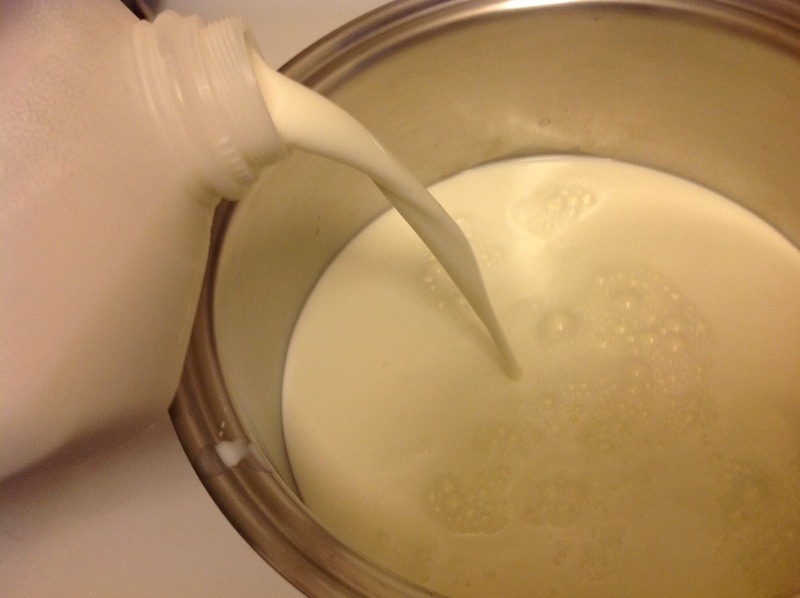 I readied my pot on the stove and added the milk and the salt and started the long process to heat the milk to temperature. I decided not to use my normal vat and just use a pot for two reasons. The first being my vat holds 14 litres of milk, it would have been over kill. The second is that I was bringing it to our Cheesepalooza meeting the next day. I also used a new setup for my thermometer; this would not work on the roaster vat. So now I waited the 30 minutes for the milk to come to temperature. Yes I know it says it should take 20 minutes but I wanted to go a bit slower. I just got home from work and this way I could spend some time with my wife and kids at the same time. 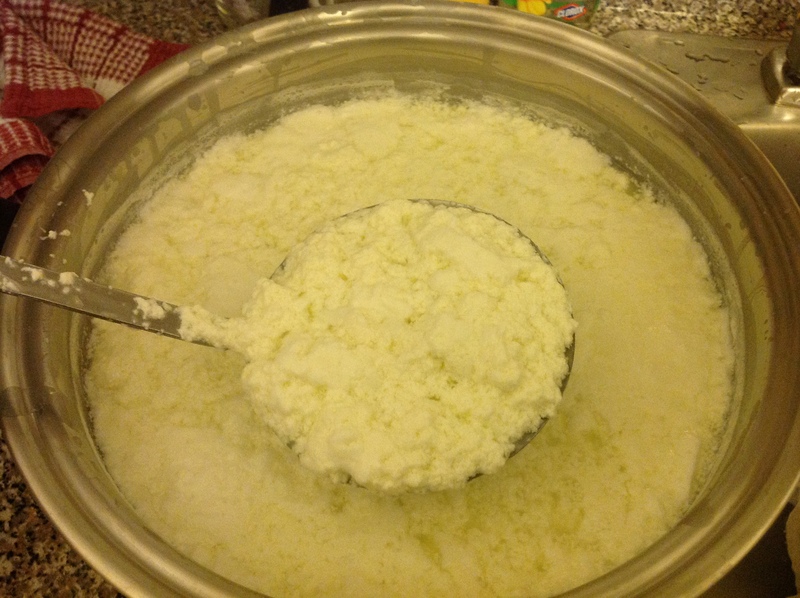 Now it was time to pull it off the heat and add the lemon juice; I could see the fluffy curd start to form right away. I then put the lid on and walked away and had some more family time for the next 10 minutes. Fluffiness and a distinct smell of a mild lemon tea was what I got when I opened the lid. Time to start to scoop it out into my cheesecloth and Ply-ban (plastic cheesecloth with an even finer “weave”) draining set up. 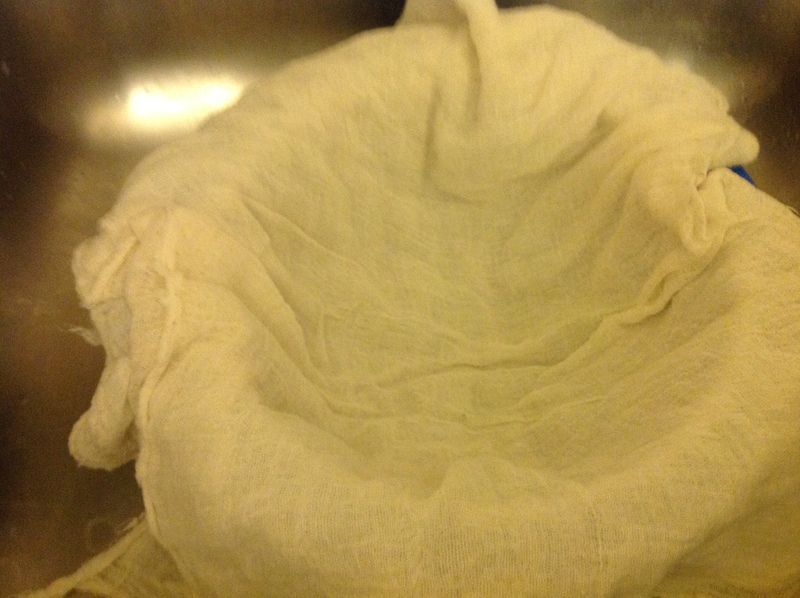 Draining Set-up – I then put Ply-ban on top of the cheesecloth. Now it was time to pull up the corners and let it drain for a bit. 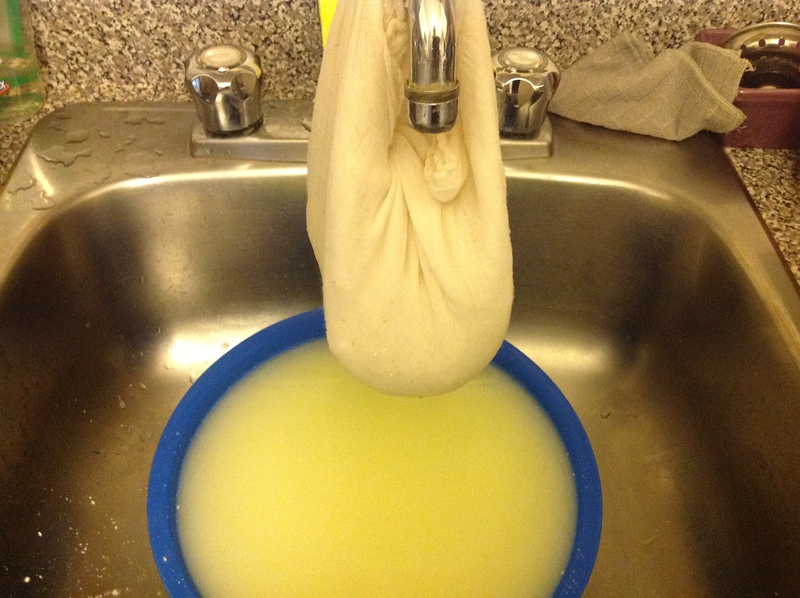 After draining for 20 minutes (I wanted it to be moist) and also straining all the last bits of Ricotta out of the whey it was time to take it out of the bag and decide what to do with it. As I mentioned before I am not a fan of True Ricotta (which is sweeter than this one) let alone this version, so in the spirit of this challenge I decided to try it in the pure state, but after I added the additional salt as per the directions. It was mild, a bit lemony, and had some saltiness to it. I think that was due to the extra salt not being fully absorbed into the cheese. I have had good reviews from my co-workers when I had made a cheese spread from shattered curd before, so that is what I would do. I divided it into thirds and went about adding some flavour to the cheese. This was great warm but just OK at cooler temperature. You can’t really see any of the herbs and spices in the bowl, but they are there. Valerie said that she could really taste the lemon in this one, Addie and Deb agreed. They did say it was nice. 2. 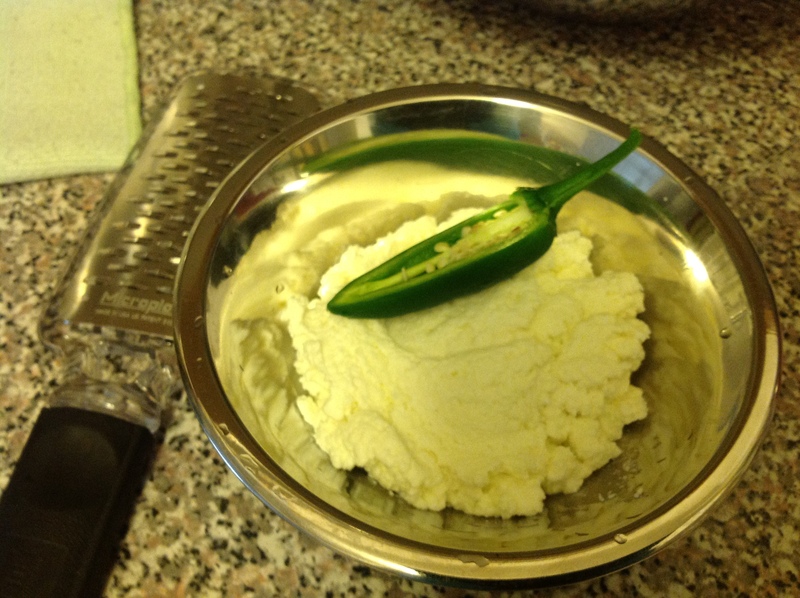 Fresh Jalapeño – This was exactly what it sounds like, I grated a half of a jalapeño into the cheese, seeds and all. IT was a bit fiery to begin with, but by our meeting it had mellowed a good deal. This one must have been good, because I came home with the least amount of it. 3. Ginger and Garlic with Pepper and Parsley – if I ever utter those words and cheese again please someone smack me. I was trying to be creative, but what I ended up making was something that just did not taste good. It smelled overwhelmingly of garlic but to me the ginger was a bit off-putting. I thought that given ginger and garlic go well in some Asian food this would work. I was wrong and I think that Valerie, Addie and Deb were just humoring me by trying it. Some of my co-workers really want to try it so I will bring it in and let the crackers fall where they may. I am sorry that there is not a picture, honestly I forgot to take one. In the spirit of Cheesepalooza I wanted to use the whey in some manner. My son and I were adventurous and drank some. He had a small sip and I had a nice glass of it. It was lemony and refreshing while it was warm. The next day I took some with me to the meeting, Addie joined me in a glass and he agreed that it was on the refreshing side and that you could probably make some good lemon aide with it. Alas when I returned home from our meeting I noticed that my tomato plant was dry and needed a drink. I took the remaining whey and poured it into the pot, and gave my chillies a drink of it too. I guess the big question is, what did I get out of this? First I can say I successfully made this cheese, it turned out the way I wanted it to. Second that fresh cheeses can be fun to make and there is not as much clean-up as with my other cheeses. Third I had fun doing this, and if I can have fun making something I don’t really like, then maybe I should stick with this making cheese thing. Just as a note Ricotta actually means re-cooked and is made from whey leftover from cheese making. This maybe Ricotta in name but really it isn’t a “True Ricotta”, that my friends will come later. Suggestions are welcome, comments are encouraged, improvements a reality. Go and make some cheese! 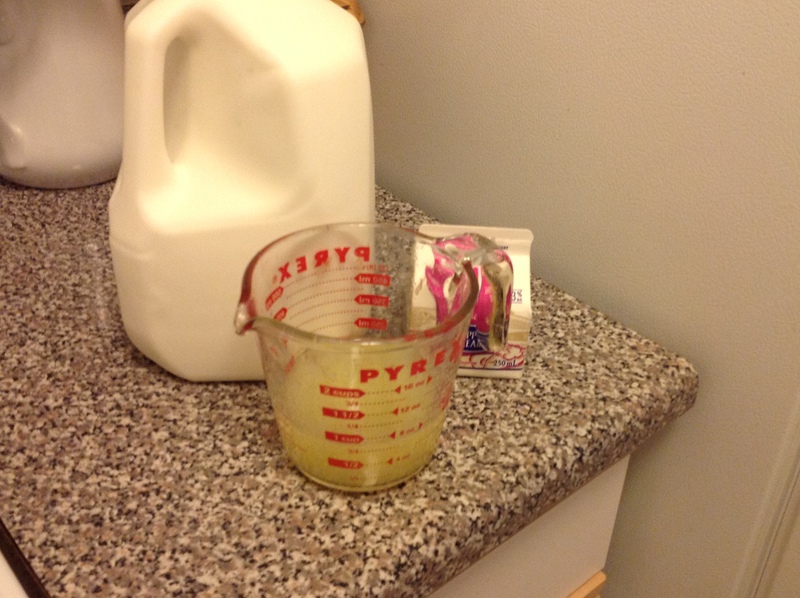 ← “Whey”ing your options – Finding your own way to use Whey! Looks great! I also find ricotta a bit bland by itself but bake it and it turns into a whole other animal! And a delicious one at that, the recipe is on my blog! Thanks Nic, I haven’t found something that I like to use ricotta with. I might have to poke around your site to get some ideas. 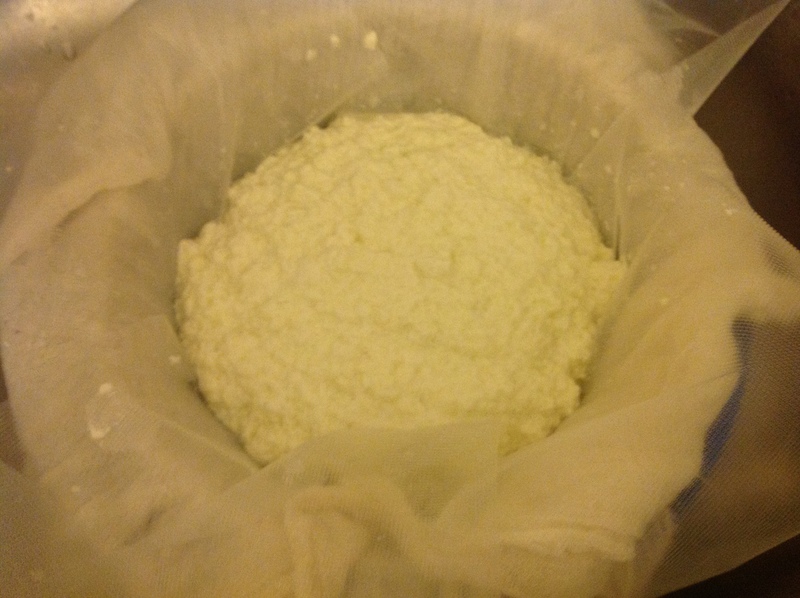 I make ricotta every time I make cheese and I let it drain really well until it’s quite dry. Then I freeze it and use it in my lasagne combined with some parmesan, mozzarella, cottage cheese and any leftover cheese I have in the fridge. It’s excellent used that way. I usually make mine with lemon juice but my recipe is slightly different from Mary’s. When I get home from holidays I’ll make Mary’s and post about it. I don’t like citric acid or vinegar. White vinegar is usually made with genetically modified corn and citric acid is not a “natural” substance. Since I never make cheese with pasteurized milk and my Holistic Nutritionist background suggests that I keep everything as natural as possible, lemon is the best ingredient to me. I like the taste of the ricotta with lemon juice as well. I have made spreads with ricotta and herbs but I actually prefer using the solids from yogurt for spreads as it has more flavour. I use the whey left over from draining yogurt to start my fermented vegetables (sauerkraut, ginger carrots etc.). 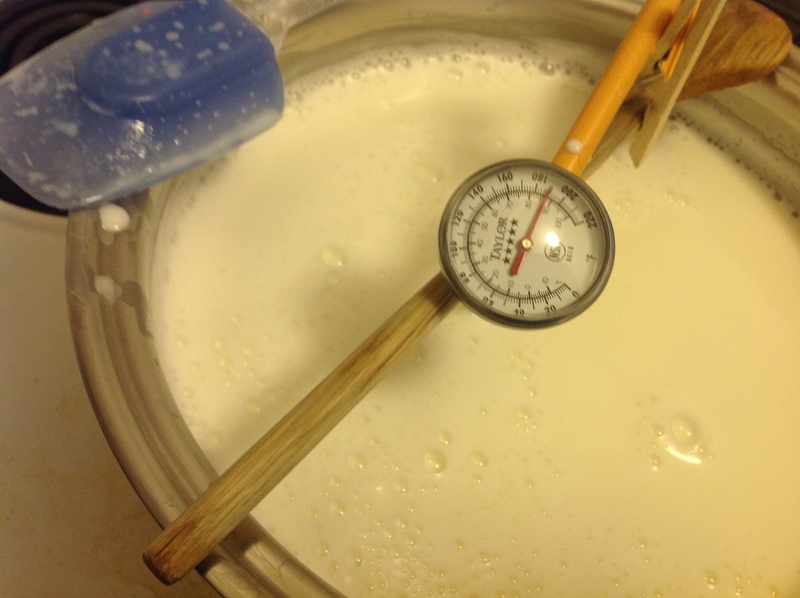 I was hesitant to use my normal milk, as the temperature you have to bring it up to is near pasteurising. I just went with store bought for this one. Mary gives an alternate to Citric Acid as lemon juice so that is what I used. Also I could not find Citric Acid at Bulk Barn. I don’t like ricotta on the best of days. O lol. Drinking the wey. Mmm maybe not so much. Love your flavor combinations though! 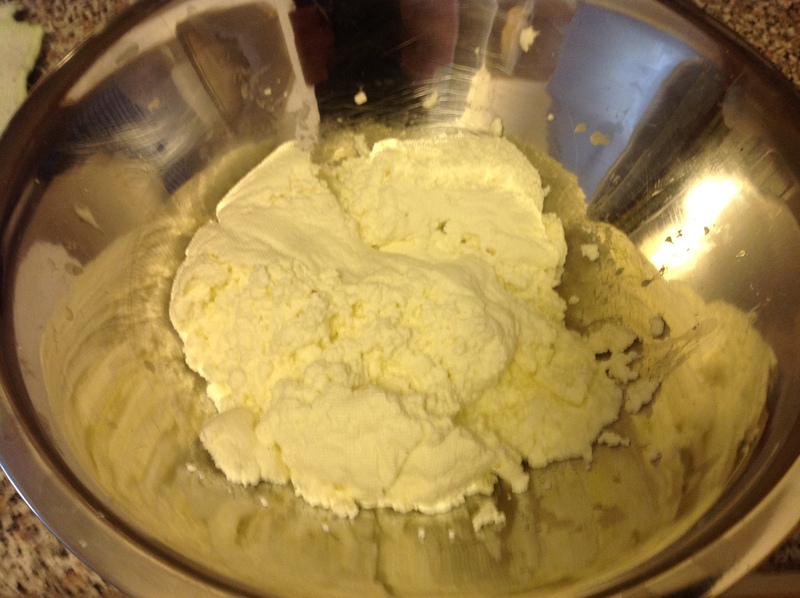 For me I do use ricotta a lot but mostly for cooking and baking so will be doing that tomorrow for my freshly made ricotta too! Thanks,the jalapeño one seems to be the winner of the tastings that I have done with family and friends. The ginger/garlic one got worse the longer it sat. 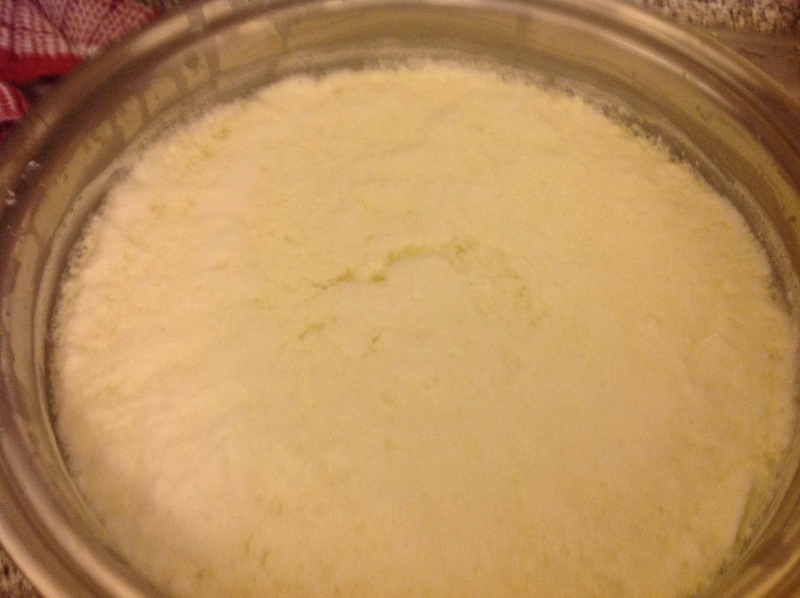 The whey was nice and refreshing, maybe it is because I used lemon juice, I don’t know how it would taste when making a cultured cheese…wait I tried the whey from the sheep milk cheese ant it was kind of nasty, but my tomatoes liked it. Great post. Loved the pics. Nice job with the ricotta. I look forward to your mozarrella + ricotta post. Like a lot of people, I make cheese, beer, honey from my bees, but mostly I make wine. I have tried a lot of flavor combinations, though never garlic-ginger… People ask me why I make wine when it is so widely available and of good quality. The same question comes up about making cheese. It’s funny about going back and re-setting the skills. That is an interesting way to put it. I find it a a pleasant challenge to re-set and make a really excellent simple wine. As much as anything the wine is byproduct of the learning process. Learning about how things are made, but more importantly learning how things taste in different states. That is why you (and I) drink the whey. Not because the whey is the product but because we learn what whey tastes like. The same in wine making, at many stages of fermenting and aging. 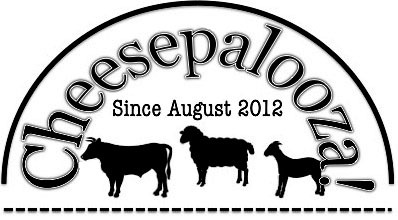 I wish the whole cheeseplalooza team good luck and happy cheese. And keep writing, because we keep reading. I originally wanted to start making my own beer, but given the fact I may only have 5-6 a year I thought it would not be practical for me. I have found a new appreciation for the whey, for the longest time it went down the drain. I like the taste and the smell. If I ever get my hands on a cream separator I am going to try and make whey butter. 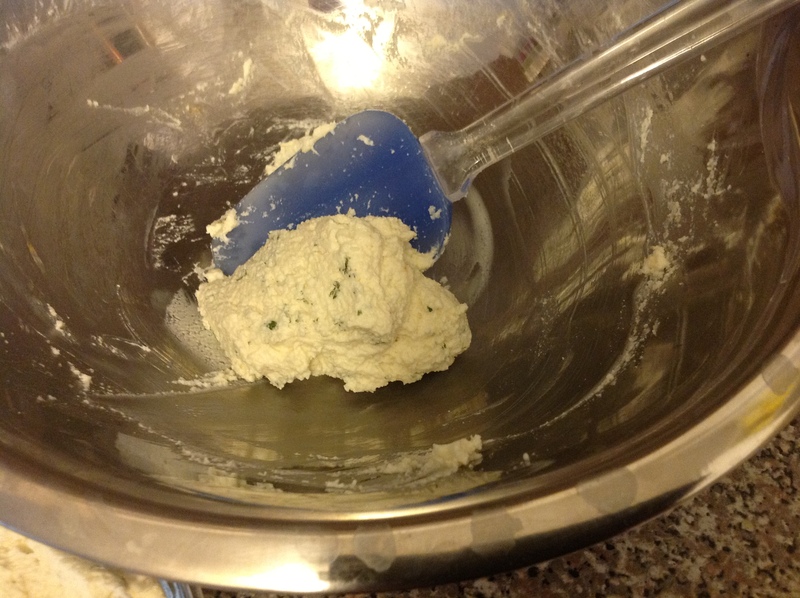 I want to make ricotta again and add some flavors to mine! I can see why you thought ginger and garlic would go together.. too bad it didnt work out. Love the idea of pressing the reset button and starting from the beginning. I find that any baking or crafting projects that require tons of research and debate (like bread making) are best started at the most basic and then slowly learned. That way you don’t start out with so much conflicting complicated information at once! I was disappointed to, I hate to waste anything especially cheese mind you not liking ricotta helps ease the sting. I skipped so much of the “beginner” cheeses when I first started out. 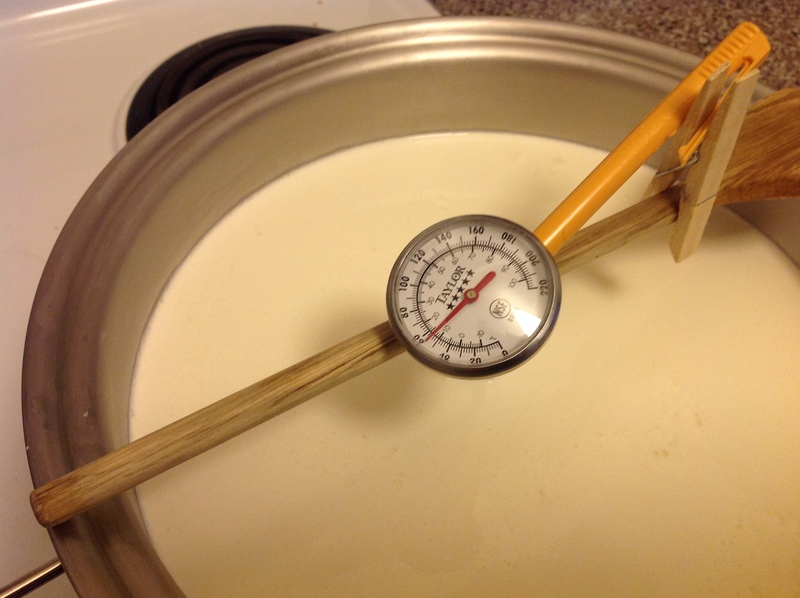 I researched cheese making for 2 years before I even bought a kit. I am enjoying the results from the reset.